Early in October, when autumn was convinced it was summer, we visited my dear friend Sarah and her children in the city. In her beautiful kitchen I stumbled upon the most beautiful and unexpected object. 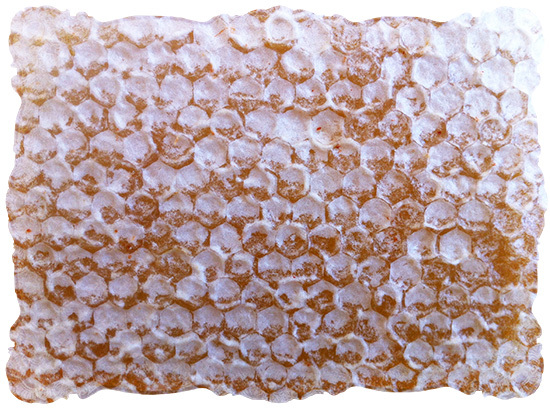 A frame from their beehive, thoroughly sculpted with honeycomb, heavy with honey. I had no idea Sarah kept a hive in the garden! I fell over. Such an astonishing, amazing thing. How much would I love to do this! Like keeping chickens, beekeeping takes some studying, a well-designed structure, a good spot in the garden and a bit of bravery – and learning from watching someone else helps so much. 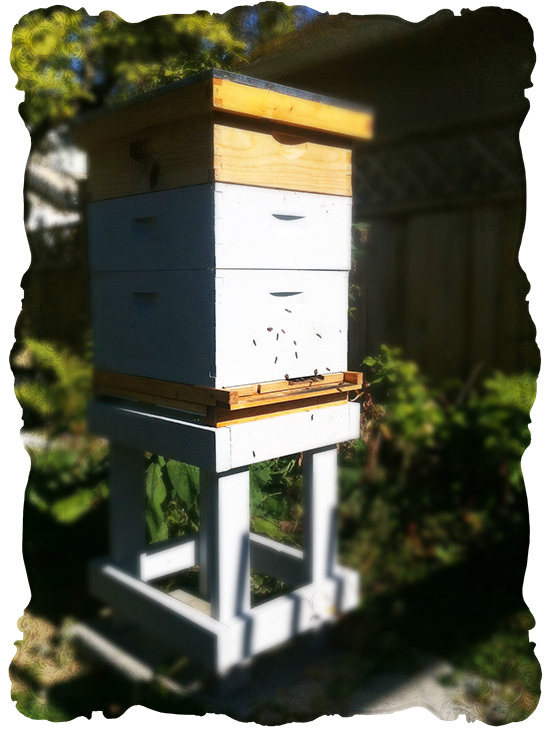 Now I have a beekeeping friend to watch, with keen interest. I’ve admired the hives on Old Plawhatch Farm near our old cottage in Sussex, and listened to a fascinating talk there by the Natural Beekeeping Trust. Sarah and I talked about how she’s caring for the bees, instinctively following principles I’ve become so interested in. What if the hive isn’t opened often, so it stays warmer, the way the bees need it? 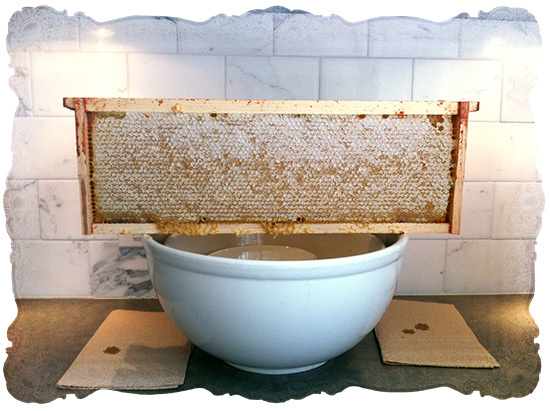 What if honey is only taken when the hive is particularly heavy, so the bees have their natural food through winter? The hive strikes me as an unimaginable treasure. The intoxicating scent of beeswax, and so many wonderful uses for the beautiful stuff; the exquisite particularity of flavours of a local honey, and its extraordinary healing benefits; the tremendous contribution a beehive imparts to the health of the neighbourhood’s flora; the utter delight of watching the grace and beauty of bees at work. I love it, I am completely inspired. Thank you, Sarah. 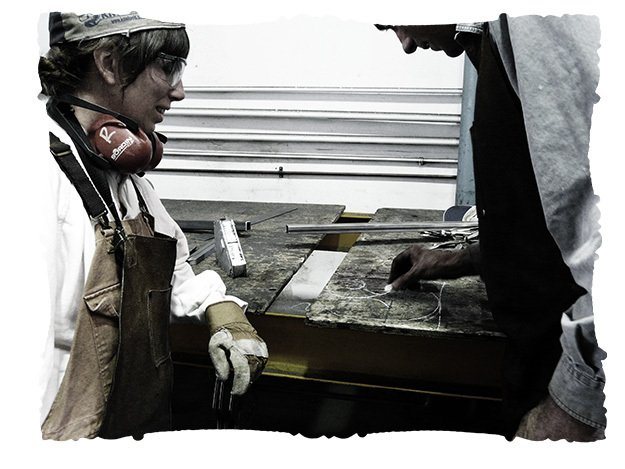 Maybe you remember my sister’s sweetheart who taught me to weld. You might recall that he secretly found someone to teach me an old skill and would only give me a few clues about what I was going to do: something hot, something dusty, after which my arms would hurt. I could not figure this out. Mysterious. One day my sister handed me some of her best grubby clothes and a pair of heavy shoes, and drove me across the city to a workshop. 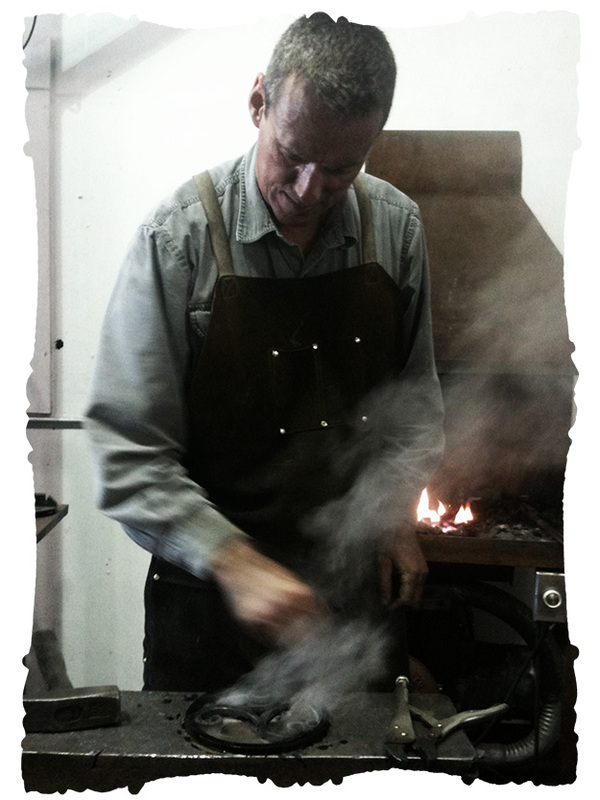 Where I met their friend Al MacIsaac, a traditional blacksmith! Oh, my goodness. Al and I were friends in a moment, confirmed by a love of drawing. He draws directly on to his tables and floors, white chalk line drawings, designing his pieces, I was elated to find such an exquisite and simple solution. 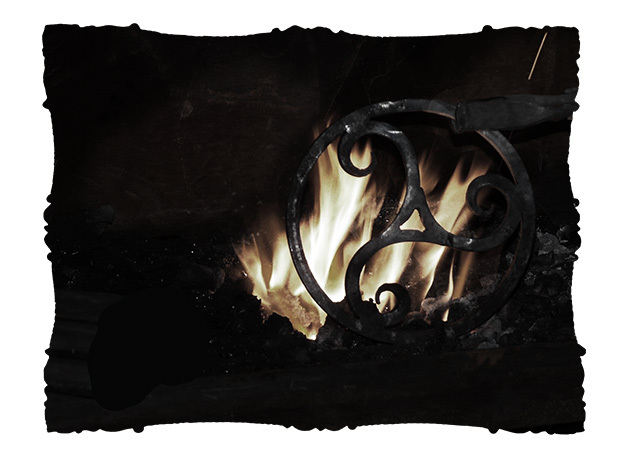 He showed us round his lovely workshop and started up the forge, and we got down to designing a little blacksmithing project together. 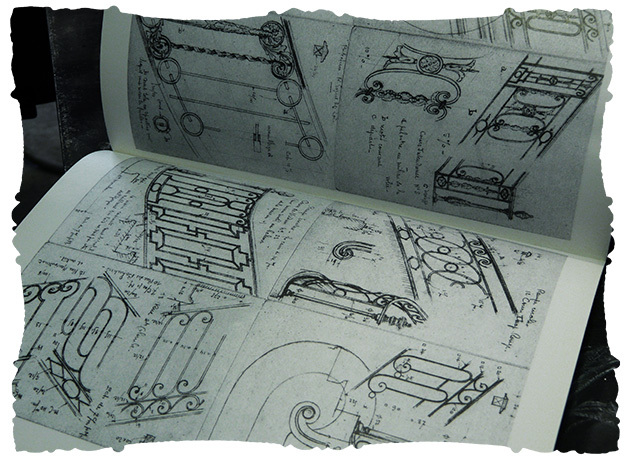 We could’ve spent hours drawing on the floor, looking at examples of scrolls in the shop and books of elegant drawings of old French wrought iron railings, made by the weapons smiths in times of peace. So inspiring, I became a bit dizzy with ideas. After elaborate plans we returned to a simple drawing of Al’s that I loved, drew it on a table, and began to work over it in metal. 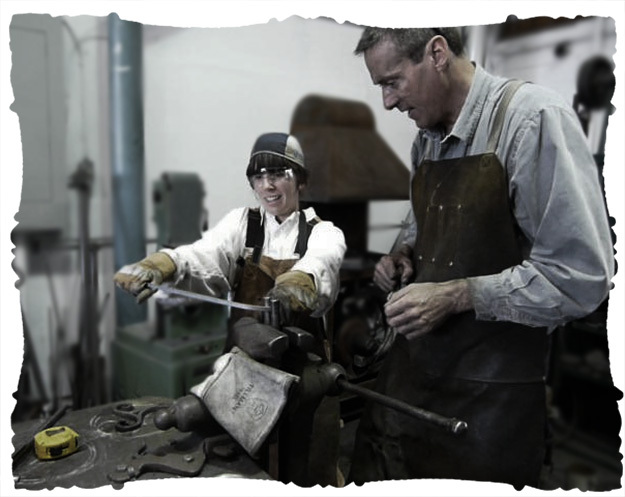 Al showed us the forge, the bellows, the anvil, the water used to cool the irons, I know he told me about the temperature that the coal burns at, the names of things, but I was quite giddy with the process of smithing and have forgotten. He apprenticed with a European master who drove him very hard, and demanded excellence, but Al knows how to teach in a gentle, disciplined, encouraging way. 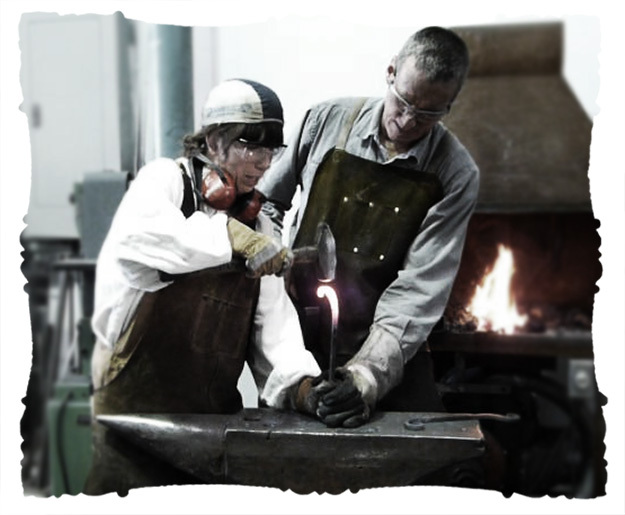 The scrolls that Al is so gifted at are made through a wonderful process of hammering the heated steel against the anvil at a slight angle, to draw them out. I began with that. My hammer’s name is Matilda, she’s so fine. My arm gave out now and then from sheer exhaustion! I love the timing, working quickly so that the heat doesn’t travel too far up the rod to burn me, returning the iron to the fire when it had cooled, taking another out, working that. 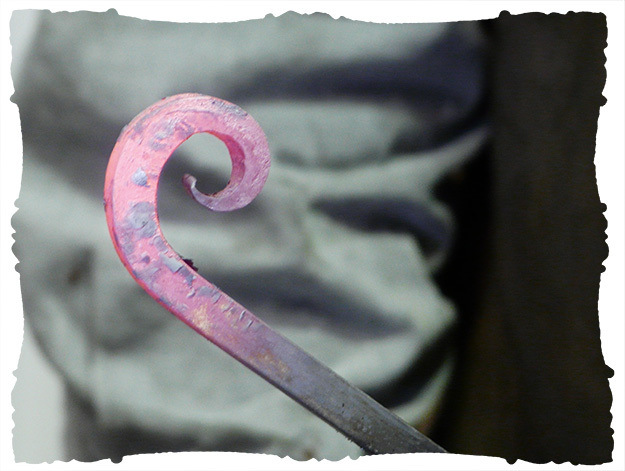 I love that the precision is all by hand and eye, Al flips the metal at a right angle to compress it, back again to draw it out further, moves it to the corner of the anvil for me to hammer it around, stands it up to begin bending that curve that surprisingly rounds into a scroll. 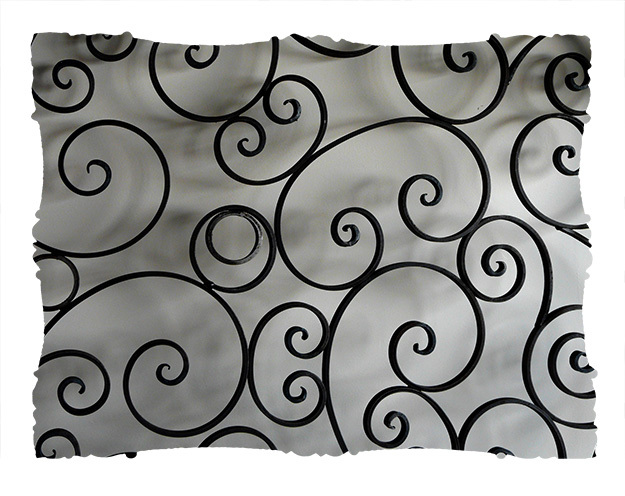 If you look closely at ironwork you can see the mark of an accomplished smith in the taper and curve of the scrolls. That turn toward a fine point is a handmade article, and as pleasing to make with your hands as it is to follow with your eyes. 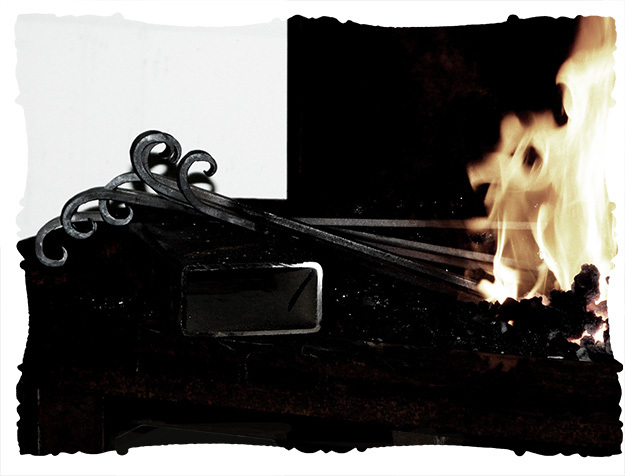 The proverbial too many irons in the fire is one of those smithy expressions I never understood before. If there are too many irons to keep working through them all, the heat will travel up the iron from the end that sit in the fire, and they’ll burn you when you pick them up, they’ll get too hot to work. I always have too many irons in the fire, now that I think of it. 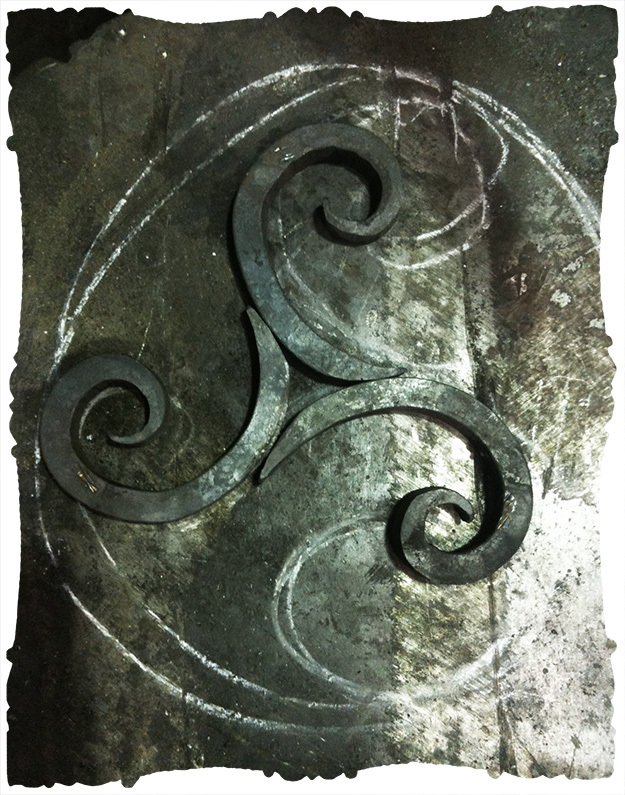 My scrolls, made with the deft and careful guidance of the master blacksmith. 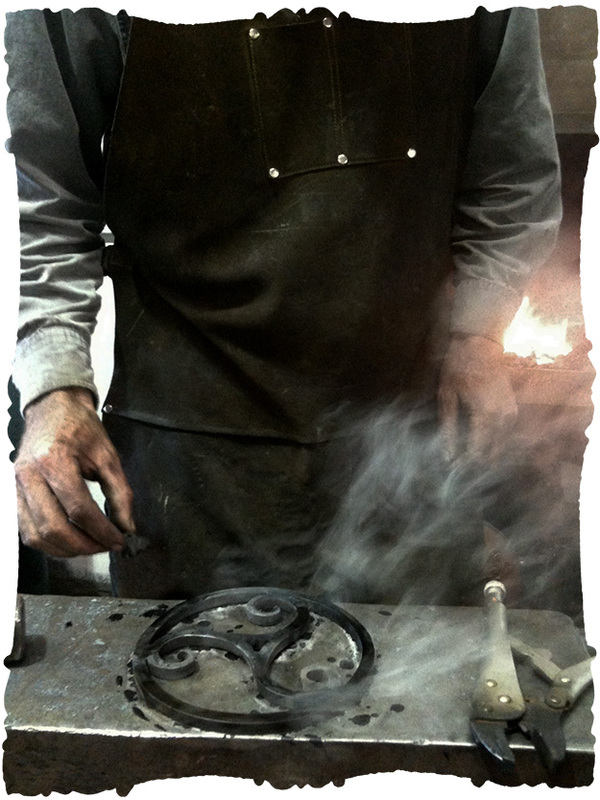 I had been taught very well by my sister’s sweetheart Richard, so I welded them together without much difficulty. Oh, here we go, it’s coming together now. 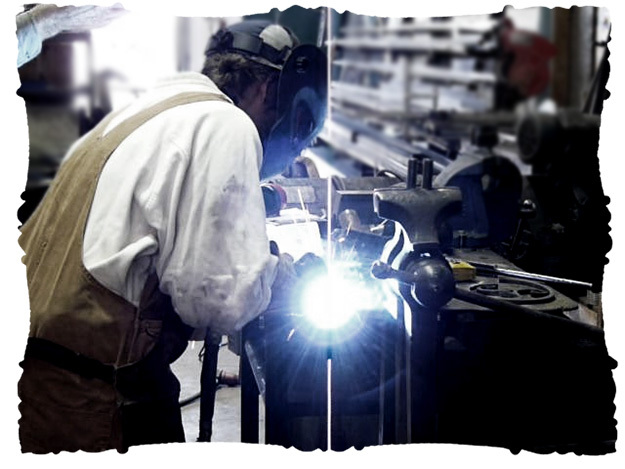 I’m ever so fond of welding. 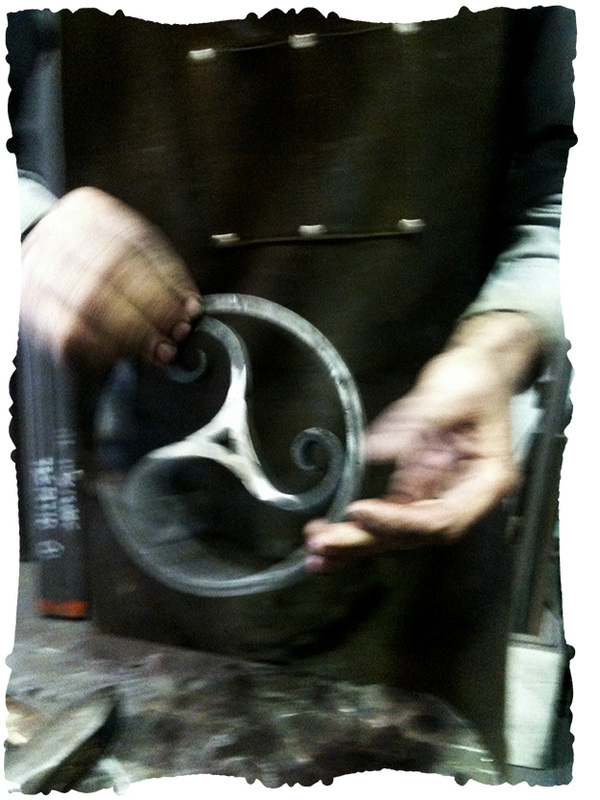 Then we set to bending metal into a circle. 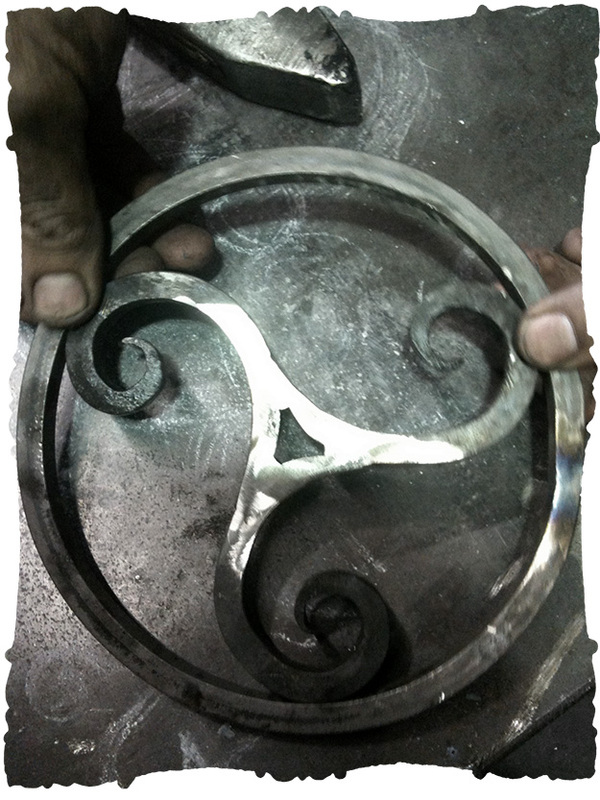 This is mild steel, so a bit easier than it looks! Al fitted the circle so expertly that he just knocked the trio of scrolls into place. 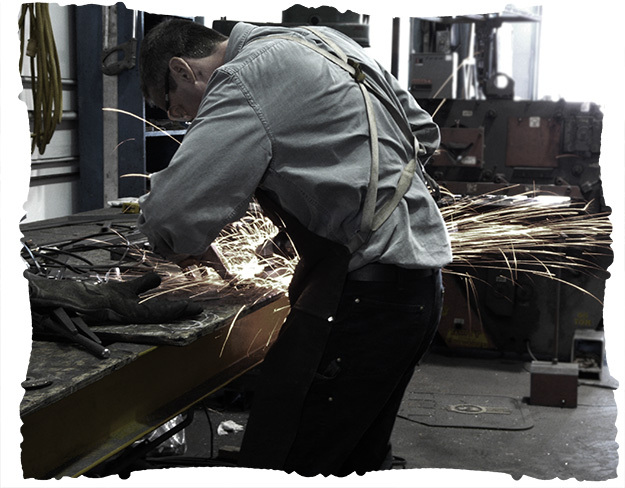 Then more welding. The welds need grinding down, and a bit of filing here and there. We were all amazed with it. Quite beautiful. To prevent oxidizing, using a traditional method, Al heated the piece in the forge again, then gave it a beeswax finish, beeswax mixed with shoe black, so lovely to watch. Then burned off the last of the polish in the fire. Complete! This was such a joyful process, we had such an tremendous time Al, thank you so much. Thanks to my sister Anita and her Richard, you gave me such a gift. 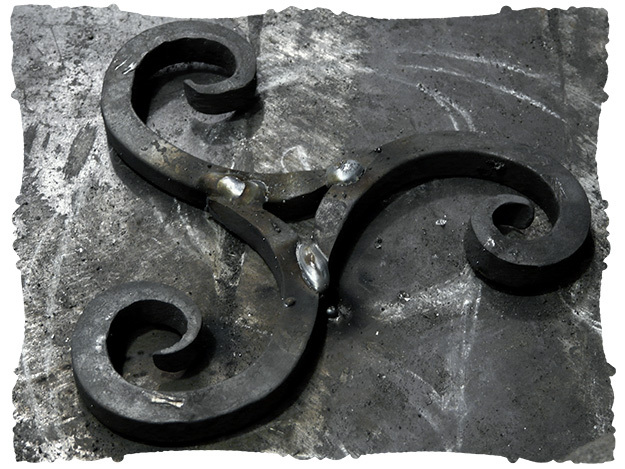 You can find the remarkable Al MacIsaac in his workshop, and his extraordinary custom ironwork installed all over Vancouver and beyond.